Companies are changing the way they are designing their office space as people are working differently. Technology is playing a role in that space utilization. PHOENIX, ARIZ. (April 8, 2019) – We live in a data-driven world. Despite the significant number of quick decisions, we make based on of data on a daily basis, step into most offices today and you’ll discover that decision-making and change are a lengthy process. AZCREW, the leading organization for senior-level executive women in the Metro Phoenix commercial real estate field, will examine workplace strategy at its April luncheon. The event is April 16 at the Phoenix Country Club, 2901 N. 7th St.
>> Rae Laser, Smart+Connected consultant for Steelcase. 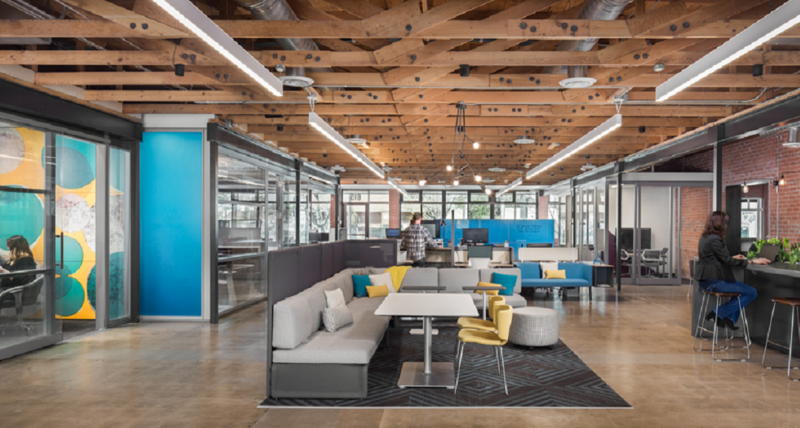 Laser specializes in the space measurement solutions, IOT (Internet of Things), scheduling tools, and collaboration technologies for Steelcase. Rae has been with Steelcase since December 2017 and has 5 years industry experience. >> Anne Garbayo is leading a Workplace of the Future at APS, designed to transform how the company defines and uses space. Garbayo has a rich and varied career at APS, which includes work on several key initiatives such as helping to establish a customer experience team. >> Devon Martin is a strategic account manager with Steelcase, where she has worked for more than 11 years. She develops, coordinates and executes an effective workplace strategy to help her clients energize their workplace. AZCREW’s April lunch begins with networking at 11:30 a.m. The program starts at noon. Member registration is $45; non-member pre-registration is $65. Lunch is included. Registration ends April 11. Register here.